It started as a humble endeavor. Michael Fitzpatrick, the lanky leader of LA outfit Fitz and the Tantrums, purchased an old church organ from a neighbor and immediately set out on his lonesome to craft some sort of soulful ode to the bygone days when Motown and Stax Records ruled the radio dial. Fitzpatrick would later turn to friend/collaborator James King for a little bit of help, and eventually a fire-breathing, seven piece rhythm and blues section for a whole lot more. Fast forward a couple years...the radio dial might be dead, but the electrifying throwback Fitz and the Tantrums have bottled up is still very much in demand. Amazingly, the band has shot from the living room to the main stage in only a couple years, sharing bills with the likes of Maroon 5 and Sharon Jones, lumping them at the head of a soul revival that, up until recently, seemed to be powered by the sole efforts of the Daptone label. Add Fitz and their label partners at Dangerbird to the movement. The LA record company released both the band's short, introductory set Songs For A Break Up: Volume 1, as well as their debut Pickin' Up The Pieces last summer. Since then, the band's been winning their audience on the road, rolling 'round the country with a show that's lead one source to proclaim, "Fitz and Tantrums are not just a band, they're an explosion!". Get hip to the firestorm for yourself. Check out a couple videos below, and don't miss your chance to go ka-pow! as Fitz and The Tantrums do their thing in a city near you. 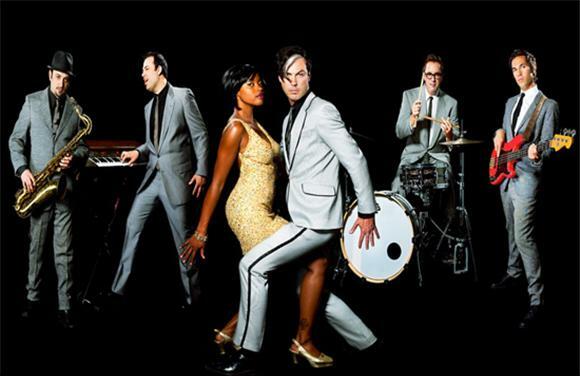 Fitz and The Tantrums - "Money Grabber"
Fitz and The Tantrums - "Winds of Change"